Solid plastic polymer plastic restroom stalls. If your restroom partition area experiences high-levels of traffic, high-humidity, or corrosive elements, consider a resilient and long-lasting material for your toilet partitions and doors. Solid plastic toilet stalls are made of HDPE, or high-density plastic polyethylene, resins. HDPE is known for its high-strength-to-density ratio, making it an exceptionally durable option for any restroom area. This material is resistant to impact, graffiti, scratches, and other forms of damage. Solid plastic partitions require very low maintenance since the surface is highly impermeable to water, odor, moisture, rust, and mildew. This also makes clean-up easy because most commercial cleaning agents will not damage the surface, and stalls can be hosed down or steam cleaned if needed. This sturdy material is offered in many different color options, ranging from basic to bold. You will never have to worry about peeling or repainting your solid plastic partitions because the color is injected directly into the mold, saving you time and money in the long run. If your public or commercial bathrooms will experience heavy use, reduce your risk and costs by choosing a dependable material such as solid plastic for your partitions. We sell complete sets as well as individual pieces for your commercial restroom such as dividers, doors, screens, and more. If you are designing a restroom that does not fit the standard sizes, please send us your drawings by fax to 800-642-2406 or by emailing sales@robertbrooke.com, so we can better assist you with any specialty needs. The commercial plastic partitions are designed to stand strong and overcome abuse and moisture. This solid plastic product will not delaminate, dent, flake, crack, rust, bend or break. The material is all 1” thick and is very similar to a cutting board at your house that is made from durable plastic. The plastic material features solid color throughout, which means that minor scratches can often be successfully repaired easily. Most hdpe solid plastic toilet partitions manufacturers provide a warranty of 15-25 years, however, the toilet partitions will last up to 40+ years if properly maintained. Solid plastic bathroom partitions can also be ceiling hung braced which presents a clean, contemporary appearance. They permit quick, easy floor maintenance, especially when combined with wall-hung fixtures. Ceiling hung partitions are recommended for modernization where a drop ceiling or open span construction can be used. 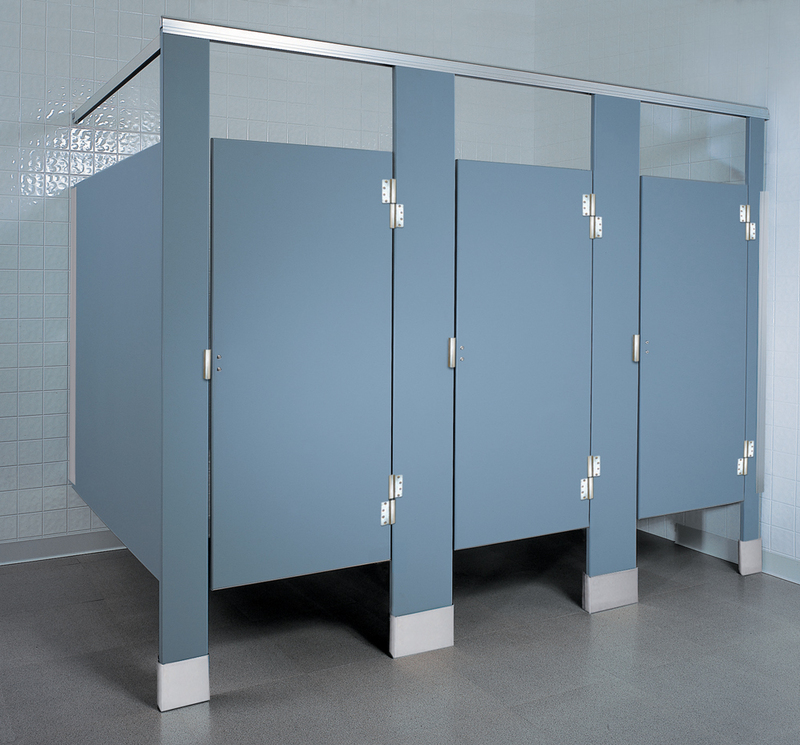 All commercial bathroom partition manufacturers now offer a no sightline solution for maximizing privacy. In addition, most manufactures use a full height, continuous stop, and hinge side filler to completely eliminate all sightline gaps around the door. A full length rubber bumper on the stop deadens sound and protects against wear. The versatility of the no sightline solution means it can be used in new and pre existing installations. Continuous stainless steel channels for all the panels and pilasters to create even more privacy. Robert Brooke has been a trusted name in the commercial toilet partition business for over 48 years. We’re eager to help with the configuration, selection, and purchase of solid plastic toilet partitions.